Advanced HAZMAT Life Support (AHLS) - F.I.E.R.C.E. AHLS is offered in collaboration with the American Academy of Clinical Toxicology (AACT), and was developed by the Arizona Emergency Medicine Research Center (AEMRC), a Center of Excellence at The University of Arizona College of Medicine. Each Provider Course involves a board-certified toxicologist and physician and is taught by AHLS verified Instructors. AHLS trains medical personnel to become AHLS Instructors who bring the course to their region. The Provider, AHLS for Toxic Terrorism, AHLS for Chemical Burns and AHLS for Radiological Incidents courses include small-group interactive case studies. 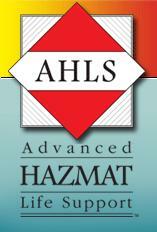 The Basic Hazmat Life Support (BHLS) Online course is an online continuing education course consisting of 11 Lessons. It begins with a pre-test and ends with a post-test and provides 3 credits of CE. The Provider and Instructor courses conclude with verification exams, and provide afour-year verification status with an 80% or higher score on the exam. After the four year verification, a participant can then take an online re-verification exam($55 for just the exam or $130 for exam and Provider Manual) within six months of expiration, one time, for another four year verification and then must attend another live course. If re-verification is not done online within 6 months after expiring, the person must attend a live course. All courses include Continuing Education credits.